*The second camp is in the Challenge Tomb and is not counted in the total on the in-game map. 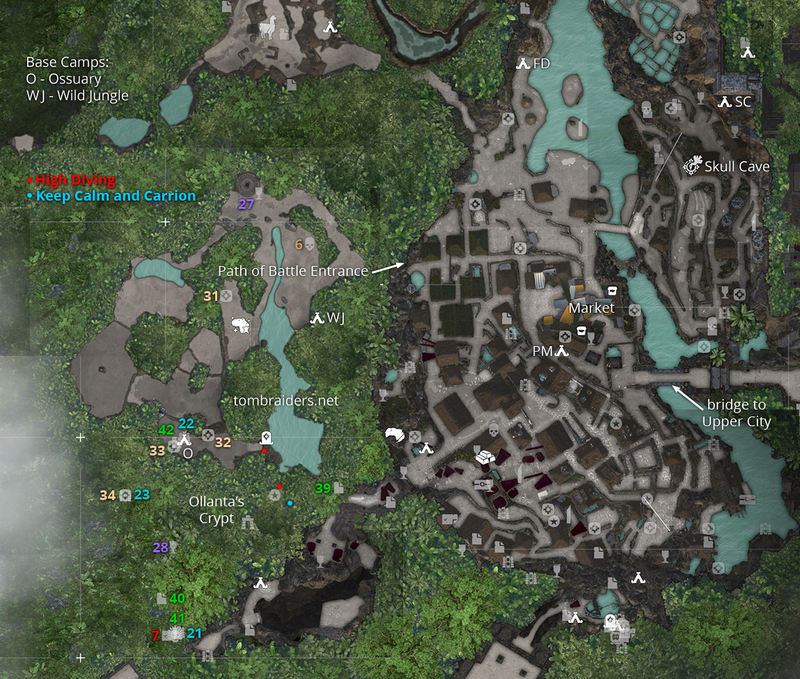 The rest of the Hidden City camps are included in the previous walkthroughs. NOTES: This walkthrough only covers the parts of the Hidden City that were not explored in the previous sections, specifically the Challenge Tomb and Crypt on the center-west side of the map and plot points following Lara's return from the MISSION OF SAN JUAN. If you missed anything in the other parts of the city, check the Lower City and Upper City walkthroughs and/or the Complete Paititi Map. The item totals above are for this section only. The AGE MAKERS SIDE MISSION and the PATH OF HURACAN CHALLENGE TOMB, which are part of the second DLC pack, THE PILLAR, are covered in a separate section. After escaping the landslide outside the Mission of San Juan, our exhausted heroes return to Paititi, where Uchu meets them at a deserted dock. Then, back in Skull Cave, Lara greets Etzli, the new king. She breaks the bad news about the Box but promises she'll get it back before Dominguez can complete the ritual. Etzli is concerned but rises to the challenge. 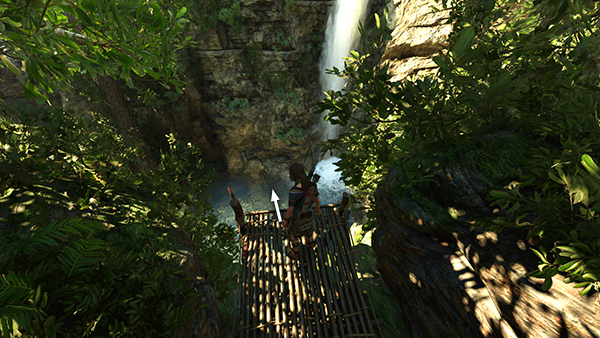 He tells Lara to take whatever time she needs to prepare while he gathers intelligence and fighters. Etzli will remain in SKULL CAVE until you're ready to proceed with the main story. When you approach him, you'll receive a warning about the "Point of No Return," meaning once you talk to Etzli, you will not be able to backtrack until you beat the game. See NOTES ON 100% COMPLETION, below. 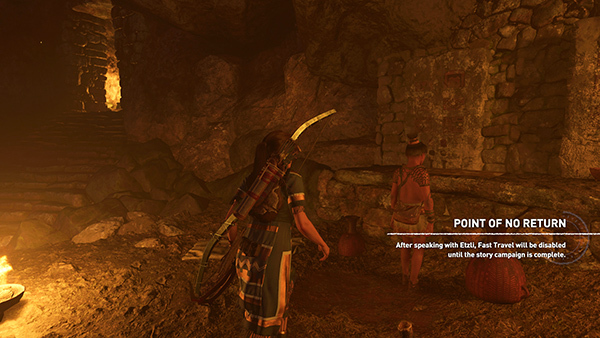 If you've been following this walkthrough, there's still a Side Mission to do, as well as a Crypt and Challenge Tomb to explore here in Paititi. NOTE: This Mission is optional, but since it takes you to the same area where the last CRYPT and CHALLENGE TOMB are located, I have included it in the main walkthrough. If you choose not to talk to Uchu, you can still explore the tomb and crypt, but you won't encounter the Nahual or receive Uchu's reward. When you've defeated the beast, it slinks off, and you're prompted to Approach the Nahual. In a short cutscene, Lara removes its mask and it dies. She is then able to take the bow. You also receive an Artifact, the Mask of the Nahual, which appears under the Myth, Magic & Monsters Story. The final goal is Return the Champion's Bow to Uchu. You can do this right away or continue exploring this side area first. There are various resources scattered in and around the pool, including some gold ore embedded below the waterfall near the south end. 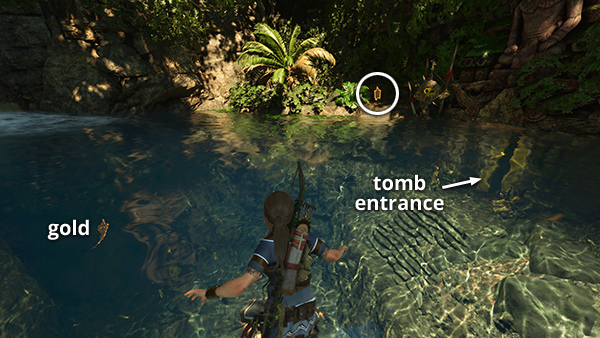 (screenshot) The CHALLENGE TOMB ENTRANCE is on the west side of the pool, just below the surface. The CRYPT ENTRANCE is on the cliff above the waterfall. It doesn't matter which you explore first. CRYPT ENTRANCE – OLLANTA, THE POTTER: Follow this link for the separate FIFTH HIDDEN CITY CRYPT WALKTHROUGH, which includes 3 documents (39-41/42), a mural (21/23), a relic (28/28), a Vestige: Ch'Amaka's War Vest, and 750 gold pieces. There's also another diving platform for the High Diving Challenge and a condor's nest for the Keep Calm and Carrion Challenge. If you've completed the other Crypts in the Hidden City, you'll also finish the Speak of the Dead Challenge upon desecrating Ollanta's sarcophagus. PATH OF BATTLE CHALLENGE TOMB: The tomb itself is covered in the separate PATH OF BATTLE CHALLENGE TOMB WALKTHROUGH. It includes the Ossuary Base Camp and various collectibles: a document (42/42), 2 murals (22/23 and 23/23), and 3 survival caches (32-34/34). 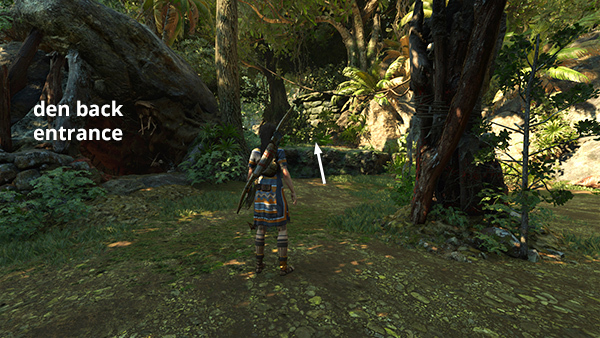 Examining the tomb stele unlocks the Seeker Skill Sip's Quiver, which allows Lara to loose up to three arrows without pulling from the quiver. When you talk to Uchu in SKULL CAVE, he presents Lara with a few rewards for completing the third HEARTS AND MINDS SIDE MISSION: a Vestige, Manko's Tunic, which will make Lara harder for animal prey to detect, plus an XP award and 350 gold pieces. You'll also witness Etzli's coronation, which takes place in a cutscene. BEFORE ENTERING THE CITY OF THE SERPENT: If you've been following this walkthrough, you should now have 100% completion in the Hidden City. If you like, you can take some time to revisit earlier levels to gather resources, pick up any collectibles you missed, earn another Skill Point or two, etc. If you don't yet have the following skills, I recommend unlocking them before moving on: Heart of the Jaguar I, II, and III and Scales of the Serpent I, II, and III. Also, if you haven't fully upgraded the weapons you intend to take, do that now. I don't have specific recommendations, since everyone plays a little differently, but I tend to go for stealthy headshots from a distance and heavy damage at close range, so my preferences are the Atlatl Bow (Paititi Market) or Heart of the Eagle Bow (Ancient Studies Side Mission), River Hawk Pistol (Kuwak Yaku Side Mission), Vicar Mark II Rifle (versatile default), and TAEV 16 Shotgun (Mission of San Juan Market) or Bishop 600 Shotgun (default). Also, be sure to get the largest containers—Adventurer's Quiver and Rucksack (Paititi Market), Large Pistol Ammo Pouch, Large Rifle Ammo Pouch, and Large Shell Holder (Mission of San Juan Market)—and fill them with resources and ammo before setting out. When you speak to Etzli in SKULL CAVE you will not be able to backtrack until you beat the game. (screenshot) There is one base camp in the final level, CITY OF THE SERPENT, which you can use to buy skills and change weapons if necessary, but it does not allow for Fast Travel. After you complete the story, you will be able to explore freely again. If you're not sure whether you're ready to face the final boss, save the game in a new slot before talking to Etzli. (On PC, press Esc then Save Game, then choose a new slot. On Xbox or PS4, open the Pause Menu and choose Change Save Slot.) Then if you find you're struggling in the last level, you can reload your earlier save and try doing things differently. REVISITING THIS LEVEL LATER IN THE GAME: Once you complete the story, if you select Continue from the main menu, you will return to the Hidden City and be able to Fast Travel throughout the game world to retrieve any important collectibles you missed. 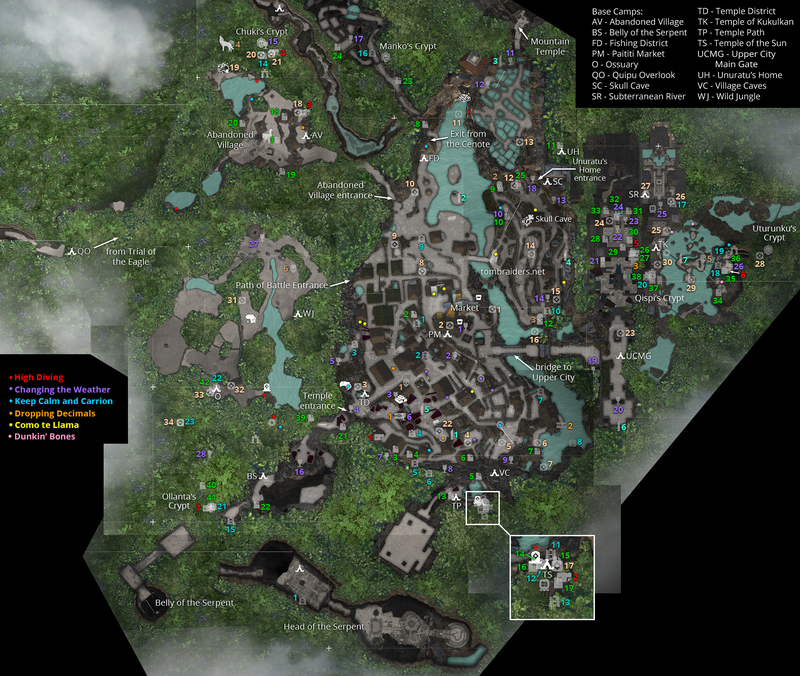 I will add Quick Collectibles Guides soon, but in the mean time, refer to the annotated level maps and the earlier walkthroughs for the Hidden City West (most of Lower Paititi), Hidden City East (Upper Paititi plus post-Cenote Side Missions), and Hidden City Revisit (this page). †UPDATE HISTORY: 1/13/19 - First draft of walkthrough posted online. 1/19/19 - Added the Mask of the Nahual artifact, thanks to secretkim88. ACKNOWLEDGEMENTS: Thanks to SpirantCrayon22 for spotting the explorer backpack I missed.